Viruses is M. Vitali (guitars, electronics), Jeffrey Smith (bass, electronics), and Rocco DiDonna (vocals, electronics). 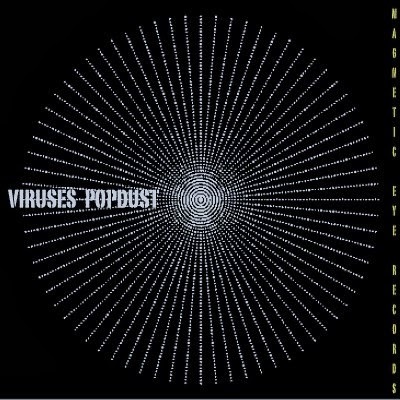 Popdust was recorded in Chicago and New York and was released through Magnetic Eye Records (MER018). "Who says you need riffs and distortion to burn one, eh? I couldn't possibly be succinct in pushing the debut release from VIRUSES, an ambient-electronic three-piece stringing together nine spacey barbs on Popdust. Ethereal, entrancing, and at times deceptively dark, this is one strange, gorgeous detour splintered by arresting digital distractions. Opening on the tense and lush Glow (Forever Fangs), we're introduced to alternating layers celebrating the organic and the synthetic while child-like distraction grows with every delightfully sporadic blip on the equally taut Earth Family Immortal. The vocal haunt evident on Lago d'Orta (Those Who Feel) channels Isaac Brock, churning and spitting with gorgeous devastation over an atmospheric drone. Industrialized stomp and primal caution somehow marry here. There are those detectable improvisations, fueled less by mind and more by heart. But just how free is this band? Subjecting themselves to no fine-tuning and relying solely on impulse seems to work pretty well, even when smoothed-out loungescapes (Landmines) evolve into peppered blasts of pixelated shrapnel (Revanans). At the end of the day, we're walking past her house. Reflecting, regretting, and yearning. The juxtapositions should be impossibly difficult to execute, but somehow they're not. The über-modern and the traditional, the patient and the impulsive, the dark and the hope-laden. Maybe they're not tip-toeing with streetside icy sadness; maybe they're cautiously crossing a frozen pond. Their destinations and motivations matter to them, sure. What matters to us is how captivating such questions can be."